The new Create program is more flexible in what it supports. We recognize that artists are always pushing the boundaries of their practice, so we’ve left definitions of eligible activities as open as possible. We’ve also increased the grant amounts for emerging and established artists, removing the mid-career or “B” category. And with two deadlines a year there will be more opportunities to access funding for projects. 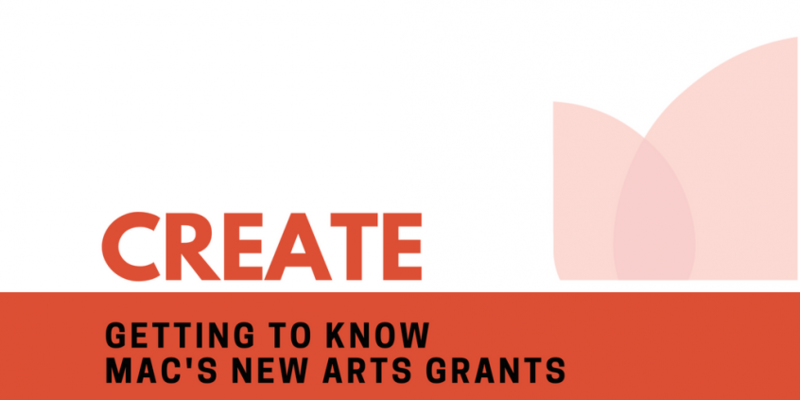 This program has two grant types that are aimed at emerging and established artists. An emerging artist can ask for a grant of up to $7,500 and established artists can ask for up to $15,000. You may have noticed that we’ve raised the maximum grants available for both emerging and established artists. This means that you can concentrate on creative projects for an extended period. In order to apply to the Create program, you must be a professional artist or a professional arts group. That means you must have a valid profile as an individual or a group on MAC’s Online Application System. To give yourself enough time, make sure that you submit your profile to MAC at least 15 business days before you want to start your application. Composers now apply directly to the Create program as professional artists. Their living expenses and commission fee(s) are eligible expenses that they may apply for themselves. Previously, in the Commission and Development Grant for Composers, the commissioner would write and submit the application. If your project involves creation, creative research, or project development, this is the program for you! This grant can help you cover direct costs related to your proposed project. Previously, creation activity and presentation activity were both eligible in a single program through the Dance Creation/Production Grant. Now, presentation activity in dance will be supported through the Support: Present program. The Create program will have two deadlines in a given calendar year. These will stay the same from year to year starting in 2019. The deadlines for the Create program are February 15 and October 10. For this year, we are offering a one-time only deadline for Create applications on December 6th, 2018. Applicants must submit their applications for any MAC program by 11:59 PM on the day of the deadline. Previously, an application deadline would move to the following business day if it fell on a weekend or holiday. This allowed applicants to deliver or mail their paper application during regular business hours. Now that applications will be submitted online, deadline dates will be fixed. Still wondering if this program is right for your project? Our new programs continue to fund the kinds of activities that were supported in our previous programs. Presentation activity in dance are eligible in Share: Present. Composers submit the application for their commissioned projects. You must have a valid professional artist profile or a professional arts group profile to apply.